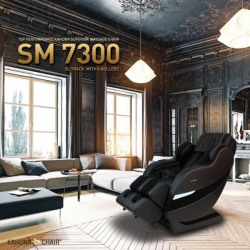 The diverse featured Kahuna SM-7300 massage chair is one of the more popular massage chairs available on the market for many reasons, whether it be its broad range of customisation options or multiple massage features. It's well built and sophisticated, however, the most important aspect in terms of making a purchasing decision for those interested in this model, is whether or not this chair actually provides a comfortable and satisfying massage experience, and if its features stand out enough to make it a good investment. Hopefully this page will allow you make an informed decision on whether or not the Kahuna SM-7300 Massage Chair is right for you. Here we'll examine the product closely, looking at its various features includes 9 different programs, each of which serve special functions, maximising comfort and satisfaction for people of all sizes and body shapes. Are There Any Problems With The Kahuna SM-7300 Model? The Kahuna SM-7300 is a unique massage chair because not only does it provide all the benefits of the standard S-Track design where the chair's rollers follow the natural curve of the spine, as most S-Track designed chairs do – it goes even further. The uses the S-track design, and additionally it incorporates the L-track design, where the mechanism is slightly different, and instead of ending at the tailbone like the S-track design does, it extends into the seat of the chair adding about 15 inches or more to its massage range. 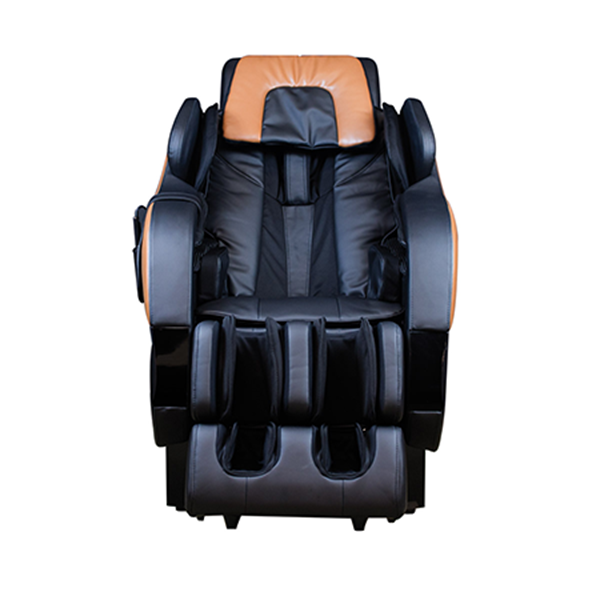 The fact that this massage chair uses both the S-track and L-track design shows the careful design and focus on quality that's been achieved by the manufacturers. The usage of both roller designs means that customers will experience a much better and more satisfying massage in general, in which the rollers will reach the glutes and thighs, as well as under the buttocks and thighs, something which the S-Track design alone cannot perform. These two very different massage roller functions have been joined together to create the best massage experience possible for users, and this is a big win for the SM 7300. This feature is essentially a massage for the calves and feet. The chair's mechanical foot rollers perform three massage techniques simultaneously, with a roller massage on the ball of the foot, pressure point massage on the sole and a gliding massage on the arch, with even the option to choose two intensity levels. The airbags built in will also perform the three massages, providing relief and satisfaction to all these areas at once. This is especially helpful if you spend many hours a day walking or on your feet. The Zero-Gravity feature is a classic feature amongst the mid to upper level massage chairs, even if the Kahuna SM-7300 only offers one Zero-G seating position, it's still a fantastic addition and overall improves the quality of the massage experience. It basically works by reclining to a state where the customer's knees are above the level of their heart which allows for a more sensitive massage, made even better with the chair's design of six rollers, instead of four. There are also speculative reports that the Zero Gravity position is great for health due to the fact that it lowers gravitational exertion on the body, improves blood flow, and has other health related benefits. 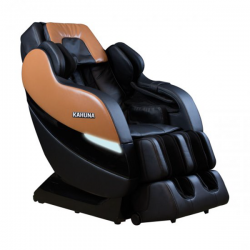 As for the Space-Saving feature, the Kahuna SM-7300 only requires 5 to 6 inches of space to recline fully, a huge contrast to many massage chairs which require 12 to 15 inches of space. This technology allows the chair to move forward cutting back the space needed to a half, an incredibly efficient feature of the SM-7300 that allows it stand out from the rest in terms of space saving and efficiency. This feature is only but one of the Kahuna SM-7300's nine, yes, nine, auto programs with this first program using a mixture of massage techniques and air massages to stretch, pull and twist your back and limbs, which helps to remove toxins from the body. It's one of the features which provides an intensity and unexpectedness to the massage experience, relieving pressure from compressed discs in your spine, and ensuring to relieve pain when nothing else is working. The relaxation program gently relaxes the muscles through a soft full-body massage where the chair uses 5 of its massage functions such as kneading, tapping, knocking and its “shiatsu” feature to ensure users truly feel the relaxation the program provides. The athlete program caters to those who like to become physically involved, partaking in strenuous sports and exercise, and what better way to relax yourself than take a full-body massage? The program helps avoid muscle injury and mitigate soreness and will help ensure athletes can unwind after a tiresome day of putting the body through its limits. Not exactly a feature but will most definitely make navigation and selection much more efficient, for the remote controls all of the auto-program and manual options. For a quick description, the remote basically has the “Quick Relaxation” button which allows you to access a short full-body massage program, a “Menu” button which helps to adjust settings such as width, intensity and speed as well as an “Auto” button which allows access to all of the auto programs. The remote may seem a bit overloaded at first, but once mastered, it makes the Kahuna SM-7300 extremely easy to use, with its good design and easily accessible features. When taking into account the reviews on Amazon.com, it is clear that the Kahuna SM-7300 massage chair has an overall positive reputation amongst buyers, with high praise and dozens of positive reviews. 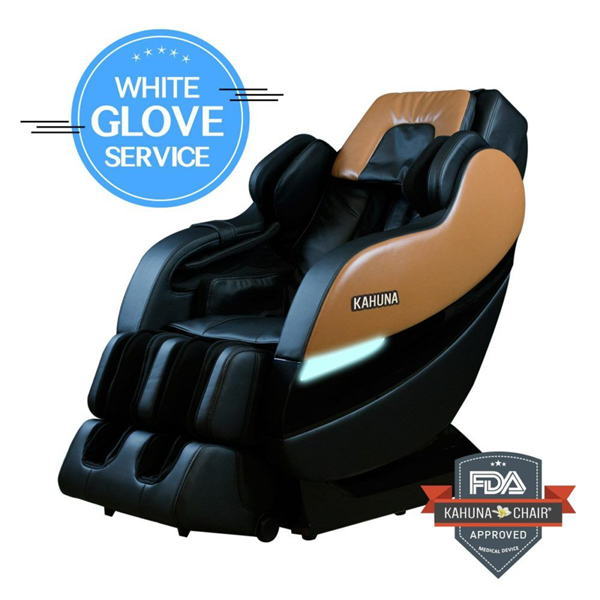 At the time of writing, there were 71 reviews, of which 79% of reviewers rated the Kahuna SM-7300 5/5 and another 17% rated the massage chair 4/5. This basically meant 96% of customers who bought the product loved it or at least liked it, whether it be the broad range of features, accommodation to people of larger body size or the overall massage experience in general, there is no doubt that most people thoroughly enjoyed this model and thought it was a great investment. There was a general consensus with reviewers of the Kahuna SM-7300, where most people ‘liked' and were ‘impressed' with its diverse range of features. The major and reoccurring positives of this chair were that it was much cheaper than other chairs and the delivery of the product was excellent. Another recurring theme amongst the reviews was the fact that this model from Kahuna accommodates to people of all sorts of varying body shapes. Many reviewers reported that despite being a completely different height and weight from their partner or close friend, they were both able to experience the same massage quality (such as one reviewer who claimed he was 6′ and 185 lbs which was a nice fit for him but was worried that his smaller wife who was 5'4″ and 135 lbs wouldn't enjoy the chair, but surprisingly, this was not the case, for she still received a very nice massage and could easily feel the air bags squeezing her). Other areas of positive feedback included the ease in assembly, where it may take up to 1 hour to assemble, 15 minutes total in setup time was perfectly possible if one were to properly read the instructions, many liked its overall appearance and labelled its construction as ‘well built'. The remote was ‘fairly' easy to use and understand for most customers, however, some said it might take a little while to get used to the controls, but in a short time they were able to get the most out of the SM 7300's features. Generally most people were very pleased with the chair's ability to cater for a wide range of heights and weights, a feature the Kahuna SM-7300 prides itself on. Also, apart from the chair's excellent massage mechanisms using both S and L track roller systems along with its built in airbags, many people appreciated the roller's ability to reach all areas of the body, adjusting to their height ‘perfectly' (as one reviewer commented) whether it be their neck, back, feet, legs or torso. Even though it was only a minor percentage of reviewers who actually disliked the Kahuna SM-7300, it must still be discussed for the sake of reviewing the product as fairly as possible. The main areas of dissatisfaction seemed to be from a bad personal experience, for example where one reviewer said the pressure and massage systems were painful specifically the feet and arm massages. They also said the instructions were in ‘broken English' and that the chair was difficult to assemble. The other two reviewers who provided negative ratings said that they could not fit in the chair despite being in the recommended height and weight range, the chair was extremely loud, the S-Track system did not work and the Kahuna SM-7300 had the ‘poorest remote interface ever'. They also found dissatisfaction with the fact that they couldn't save the remote settings. The negative feedback was somewhat of a contradiction to the positive feedback, but it may not necessarily be because they hated the product for its actual inherent design, they may have just received a faulty model and therefore criticised the Kahuna SM-7300 as an overall product. Despite the Kahuna SM-7300's abundance in positive reviews, that small percentage of negative feedback shows the product is not necessarily perfect. The common complaints found within the Amazon reviews show that there are things that could be improved and upgraded with the next model. It is important that we take into account every review, whether positive or negative to create our overview and in this case, to look at the problems associated with the Kahuna SM-7300 massage chair. Perhaps the most common complaint is the remote control and its inability to save its settings which meant a huge inconvenience to users. Reviewers may have been experimenting to see which massage method they enjoyed and preferred the most such as the kneading massage, or the Athlete Auto program but had to manually select these two options every single time they wanted to use the massage chair. Convenience is a major factor of a product like this and it is most definitely compromised with the remote control's inability to save settings. Other minor flaws include the poor instructions, where some may not understand the manual's ‘Broken English' and may take much longer than necessary to actually assemble the massage chair, pay a pricey assembly fee or may even give up altogether. Reviewers claimed there were grammatical errors and words that weren't even spelled correctly, which may damage the credibility of the product as a whole. Luckily, the SM 7300 is relatively easy to assemble. Despite the minor problems of remote memory loss and the poor instructions, the Kahuna SM 7300 is still a massage chair that has a huge amount of positive feedback from customers overall, and this has to communicate something about the overall value of this particular massage chair and its viability as a worthwhile investment. There are tonnes of places online to choose from such as Ebay, Ali-Express or Walmart, but in this case, it may be the best choice to go with Amazon simply because of the fact that it's the largest ecommerce website in the world, and therefore has really tight security and protection from all sorts of online scams such as fraud or identity theft. Millions of people use Amazon, so it's only natural that the website has developed a very strong system of online and financial protection compared to other online sites. The Kahuna SM 7300 and the other Kahuna massage chairs are made in China. This is quite common when it comes to massage chairs, and many other companies manufacture their units in China. Does this chair have a heat option? Yes, there is also the option to increase foot pressure. Does it come with an instruction booklet? Normally it does, but if it doesn't you can always refer to the Youtube installation video above. Does the chair return to its original upright position at the end of the massage? No it does not, it remains in the state in which the user has last left it in, whether it be any program or manual setting until you press the off button. Will it massage the thighs? Fortunately it does include the thighs. It massages from your head down to the bottom, then calves, feet and thighs. How many positions does the chair have? The Kahuna SM7300 has multiple positions, such as Zero-Gravity or Yoga Setting, just to name a few. Can I sit in the massage chair like a normal chair? Not exactly, it is not the most comfortable general purpose seat because the rollers park in the seat, and would be recommended as being primarily used as a massage chair. If you are just after a REALLY comfortable chair/recliner, then the Human Touch PC 610 might be the kind of thing you're after. Are you able to listen to earphones while the chair massages? Yes, the chair should be quiet enough, however there is no in-built mp3 player. No, it comes in two large boxes, one containing the main body and the other holding the side panel, requiring assembly. Can I get the product assembled automatically? Yes, if you purchase the white glove service it is assembled upon delivery, with of course, an extra fee. Does the chair massage my calves? Yes, it uses airbag technology to massage the calves, squeezing them with inflation, it also directly massages the feet. Will this fit a person who is 6′ 6″? Unfortunately, it probably won't, because it is not recommended for a person above 6′ 5″. Is there an option to receive extended warranty? Yes, however, the warranty must be purchased directly through Amazon if it exceeds the warranty period that is offered. Is there a way to extend the massage time past 30 minutes? Unfortunately, no, it is not recommended to use more than 30 minutes at a time simply for maintenance purposes and you should allow a 30 minute to 1 hour break. Overall, the Kahuna SM-7300 is definitely worthy of its price tag, meaning the price tag most certainly reflects the quality of this particular model chair because of its multiple features, broad customisation options and advanced massage techniques, which allow this chair to do a great job at giving you an amazing and deeply relaxing massage. The fact that this chair will work for many different types of people with different body masses and frames, makes it unique compared to other chairs on the market. Also worth taking into account are the excellent available built in massage programs, all 9 of them, including the Athlete, Relaxation and Yoga-Stretching Auto Programs. Also, the massage techniques including kneading, shiatsu, tapping and knocking allow for the user to experience the ultimate full body massage, not forgetting areas like the calves, thighs, buttocks, arms, legs, feet, spine and torso. The chair is an excellent mid range addition to Kahuna's line, and offers a little more in terms of functionality than its little sister the Kahuna LM-6800. Even though like all products there are some small negatives, such as the inability for the remote interface to save manual settings, and the apparently ‘Broken English' instruction manual and depending on the user, we think that the feedback for this chair shows that it's an obvious good choice for those looking for a mid range massage chair that's going to provide deeply relaxing massages in the comfort of your own home.